Om Prakash Mitharval wins Gold in Men's 50m Pistol at ISSF World Championship. 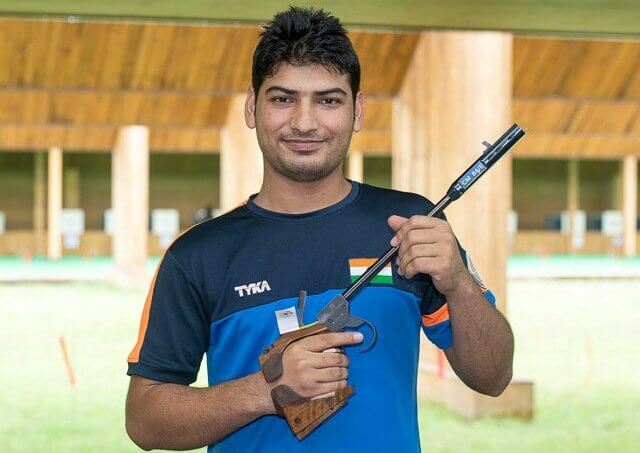 Om Prakash Mitharval won the gold medal in men’s 50m pistol at the 52nd ISSF World Championship in Changwon, Korea. The 23-year-old Mitharval became the fourth Indian shooter to be crowned a World Champion behind Abhinav Bindra (2006), Manavjit Sandhu (2006) and Tejaswini Sawant (2010). Mitharval won the title with a score of 564/600. 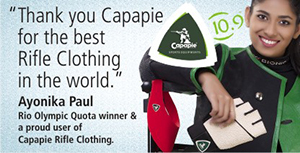 There was no final in the event as it’s no longer a part of the Olympics. Mitharval started his match with series of 92 and 90 but climbed up the charts with a fantastic 97, he then sealed the gold after shooting 95,96 and 94. 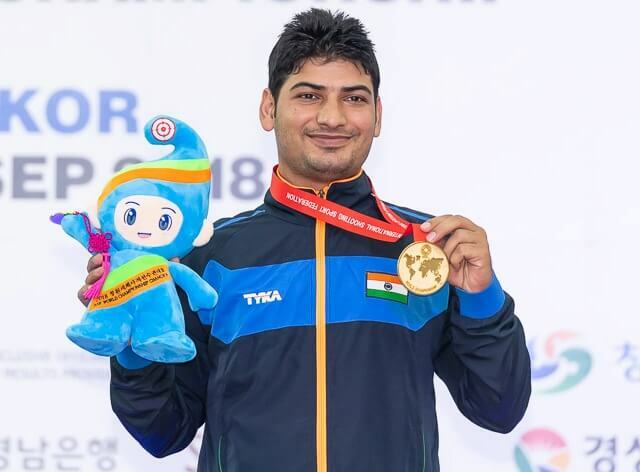 This is Mitharval’s best performance at a world event, after having won bronze medals in 10m air pistol and 50m pistol at the Commonwealth Games, earlier this year. Jitu Rai, who had won silver in the same event at the 2014 World Championship, finished 17th with 552. Another Indian in the event, Manjit shot 532 to finish 56th. Serbia’s Damir Mikec won the silver with 562 while Korea’s Daemyung Lee shot 560 to take the bronze. In the team event, Mitharval, Jitu and Manjit finished fifth with a score of 1658/1800. Korea won the gold with 1670. Silver was won by Serbia with 1667 while China took the bronze with 1661. 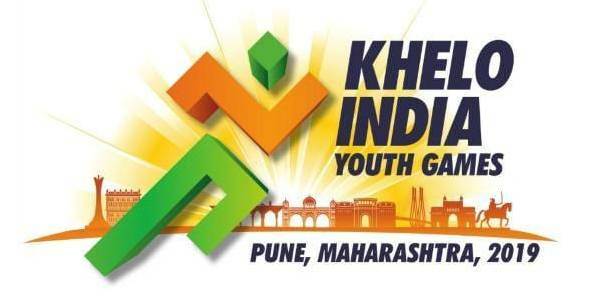 Asian Games gold medallist Saurabh Chaudhary and Abhidnya Patil shot a score of 407.3 to win the bronze in the junior air pistol mixed team. The other Indian team of Devanshi Rana and Anmol Jain also made it to the final but finished fifth with 324.9. 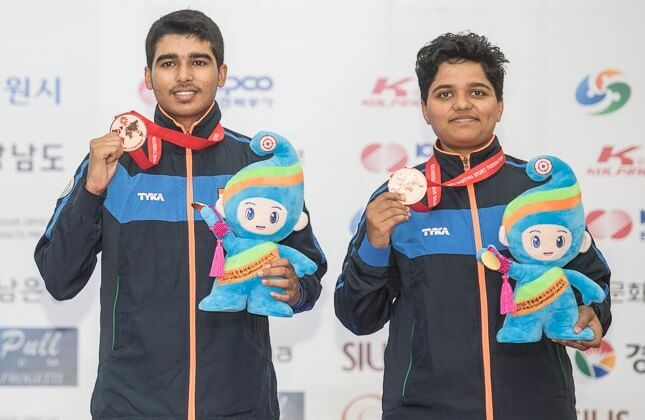 From left: Saurabh Chaudhary & Abhidnya Patil win Bronze in Junior 10m Air Pistol Mixed Team. The gold was won by Choo Gaeun and Sung Yunho of Korea with a junior world record of 483.0 while Korea-2 pair of Hyunyoung Yoo and Hojin Lim won the bronze with 473.1. In women’s 10m air pistol, teen sensation Manu Bhaker shot a score of 574 to finish 13th while Heena Sidhu finished 29th with 571. The third Indian in the fray, Shweta Singh shot 568 to finish 45th. Olympic champion Anna Korakaki of Greece won the gold with 241.1 in the final. The silver was won by former World Champion Zorana Arunovic of Serbia with 239.8 while Korea’s Bomi Kim took the bronze with 218.8. The three medallists as well as the fourth ranked Wang Qian of China won the Olympic quotas for their countries. In the team event, India finished fourth with Manu, Heena and Shweta combining for a total of 1713.1. China won the gold with a world record of 1739. Silver was won by Korea with 1734 while Russia took the bronze with 1720. Men’s 50m Pistol: 1. Om Prakash Mitharval (India) 564; 2. Damir Mikec (Serbia) 562; 3. Daemyung Lee (Korea) 560; 17. Jitu Rai (India) 562; 56. Manjit (India) 532. Men’s 50m Pistol Team: 1. Korea (1670); 2. Serbia (1667); 3. China (1661); 5. India (1648). Women’s 10m Air Pistol: 1. Anna Korakaki (Greece) 241.1 (584); 2. Zorana Arunovic (Serbia) 239.8 (583); 3. Bomi Kim (Korea) 218.8 (580); 13. Manu Bhaker (India) 574; 29. Heena Sidhu (India) 571; 45. Shweta Singh (India) 568. Women’s 10m Air Pistol Team: 1. China (1739 WR); 2. Korea (1734); 3. Russia (1720); 4. India (1713). Junior 10m Air Pistol Mixed Team: 1. Korea (Gaeun Choo, Yunho Sung) 483.0 WRJ (766); 2. Korea-2 (Hyunyoung Yoo, Hojin Lim) 473.1 (761); 3. India (Abhidnya Patil, Saurabh Chaudhary) 407.3 (761); 5. India-2 (Devanshi Rana, Anmol Jain) 324.9 (765). Om Prakash Mitharval Shoots a GOLD!